The term “DID” stands for “Direct Inward Dial”, and describes a feature offered by traditional telephone operators. Essentially, we allocate your local number ( DID ) to your EVCMOBI account, in much the same manner as one might be assigned a home phone number or an email address or a website domain. (i.e DID numbers are “unique”). You can have as many Local numbers ( DIDs ) as you want on your EVCMOBI account. Eg. lets say you live in NY, but you also have relatives in Italy or the UK. You can purchase a NY, DID number 1212....... so that everyone in NY can call you locally. You can also purchase a second DID, for the UK eg. 4420...... ( London ). This way, anyone calling the UK number , will also ring your account, without any charges , roaming fees or international long distance charges. With EVCMOBI everyone wins. EVCMOBI offers you Local numbers ( DID's) in more than 62 countries and thousands of cities around the world. Each EVCMOBI account can host from one to multiple Local numbers ( DIDs ). With the purchase of a Local number on your EVCMOBI you are able to receive calls from NON EVCMOBI users. This means that anyone can call you on your Local number , from any network , from any landline or mobile ,from anywhere in the world. You can keep your local number private for your friends and family or you can share it with everyone, its your EVCMOBI 2nd number on your mobile. Example: If you live in the USA but have family in the UK, you can purchase a UK Local number so your family in the UK can call you with a local call to your EVCMOBI. Free voicemail and many more calling features. Yes, customers can change their caller ID to show any of the local numbers ( DID's) they have purchased. Just login to your customer portal : MYACCOUNT and adjust your profile setting to show the Caller ID of your choice. 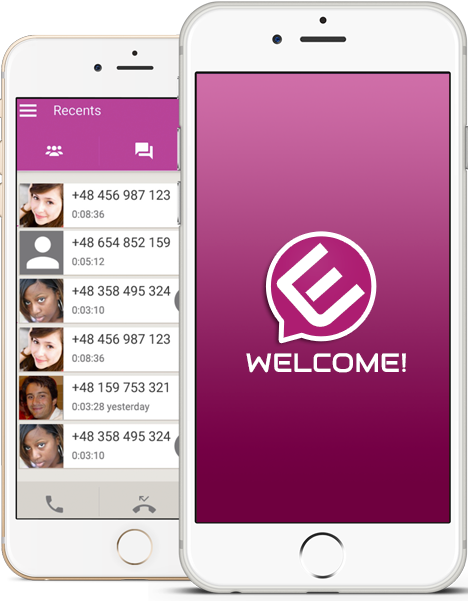 You can receive calls, text, chat, video and exchange files for FREE with all EVCMOBI users. To receive calls from NON EVCMOBI users, you will need to purchase a Local number (DID). Once purchased , anyone calling you on this number will reach your EVCMOBI account. You can receive the call on your EVCMOBI mobile app, tablet or your PC. You can purchase Local numbers directly from your EVCMOBILE app. For advanced management of your Local Numbers, you need to log in to " MY ACCOUNT" using your web passwords. In your customer portal you can record greetings for voicemail , and take advantage of all the free calling features. With "Find me", you can divert incoming calls and forward them to another number , phone line or voice mail. The customer has the ability to manage his incoming calls and forward or redirect them to any phone line , FAX or voicemail. The customer can record different greetings for different situations and apply them to any one of his local numbers. From Mobile: Simply open the EVCMOBI application and proceed to MY ACCOUNT. Here you see all the charges, check rates prior to calling, select from available plans and purchase local numbers. From PC: Login to MY ACCOUNT and select "call history" to see the calls you have made and the charges incurred. You can also see your account balance, payment history, history of calls you made, and manage your account. 1) From your EVCMOBI: Go to Settings -> MY ACCOUNT, and press on TOP UP button. 2) From your PC: Go to MY ACCOUNT . Once you log in, Select "TOP UP" from the menu. In both scenarios, you can select the amount you want to top up and your prefered payment gateway. We accept PAYPAL or credit card (if you dont have a paypal account, use the link: "Don't have a PayPal account? Use your credit card or bank account"). 3) Top up vouchers: Purchase a voucher from one of our retail partners. Select voucher as your payment method from TOP UP add the voucher number in the requested field. All plans are displayed on the EVCMOBI mobile app. Open EVCMOBI, go to MY ACCOUNT, click on PLANS button and select the plan that best suits your needs. To activate the plans you have to have sufficient balance in your account. Check the value of the plan you wish to purchase and add the appropriate funds to your EVCMOBI account. Then proceed to purchase and activation of the plan. EVCMOBI - app : All functionalities from your mobile! Send sms, call world wide, recharge your account from your mobile, add a free second line to your mobile. The EVCMOBI app is designed for Android and IOS operating systems. EVCMOBI (PC) : A live virtual telephone hosted on our servers, offering all its services through the customer portal. No installation is required. Ready to use by logging in to MY ACCOUNT. Perfect for customers that might use it from internet cafe's or other public pc access points. It's a multi-functional softphone that ensures the highest quality performance, providing a range of appropriate functionalities, including calling, SMS, chat and video. Other service features include: speed dialing, address book, easy access to recent calls, outgoing numbers, messages in real time, call cost in real-time, voice mail messages stored on our server, "call transfer" and "do not disturb" services, direct access to your call history, online charges and online top-up. HOME SERVICE : With the purchase of an IP phone deivce you can set up your EVCMOBI account right from your home so everyone in the family can benefit from our great rates. Call world wide, and receive calls to your local numbers directly to your IP phone device. • Register phone numbers for pin less dialing. Add your home number or your number at work, and use the service with pin less dialing by calling our access numbers. • MOBILE TOP UP - NEW FEATURE- TOP up family or friends mobiles in any country. • DO NOT DISTURB - block any unwanted numbers from ever calling you again with one click. Its never been easier. EVCMOBI is free to download and free to use with other EVCMOBI users. EVCMOBI users have free calling, chat, and video with other EVCMOBI users no matter where they are world wide. EVCMOBI users can also call other NON EVCMOBI users by using the EVCMOBI-out service. EVCMOBI-out service is tailored for each country , making it cheaper than ever to call, sms and chat with NON EVCMOBI users. Select to pay as you go or select one of our attractive plans. We are so sure that you will love our quality, that we are giving away Free credit on EVCMOBI out to every new user and download so you can test it for FREE!. EVCMOBI is free to download and it saves you money everytime you use it ! The EVCMOBI customer portal comes equiped with our latest online softphone (software that simulates a real phone) so no installation is necessary. It works just like a normal phone line ,offering all EVCMOBI services through the Customer portal : MYACCOUNT. To use the application, please login to MY ACCOUNT and press the call button. Its that easy. You will require the use of a headset (earphones and microphone). EVCMOBI out allows you to call or sms any lanline or mobile world wide, even if they dont have EVCMOBI. In the app we display all the rates and plans available for each county. Pay as you go or select one of our attractive plans, you always save money with EVCMOBI. Try EVCMOBI out for Free today. We are giving away free credit on your EVCMOBI out with every download! No strings attached! Customers can use EVCMOBI as a home service in many ways. 1) If you have internet at home , you can purchase an IP device ( phone ) and use EVCMOBI from your home. Benefit from all the advanced features. and accept calls to your EVMOBI local number. 2) If you do not have internet at home or on your mobile , but you need to make a call. You can use EVCMOBI call connection service. By activating this service, you can make your call with EVCMOBI and our Automatic operator will call you back immediately with instructions to connect your call. Ok, dont panic, EVCMOBI has a solution for all situations. Remember , EVCMOBI is an app, and like all apps, they need internet to function. All advanced evcmobi services are based on the quality of your inernet, 3G or wifi connection. If you face problems with your internet, this affects the quality of our services. You should therefore contact your internet provider ( Its always good practice to shop around when looking for an internet provider. Select a trustworthy network with good speeds and a steady signal).